A collection of small user guides in PDF file format. This list is short at the moment, but it is being being added to! Most of the guides assume you have a working knowledge of bookkeeping. 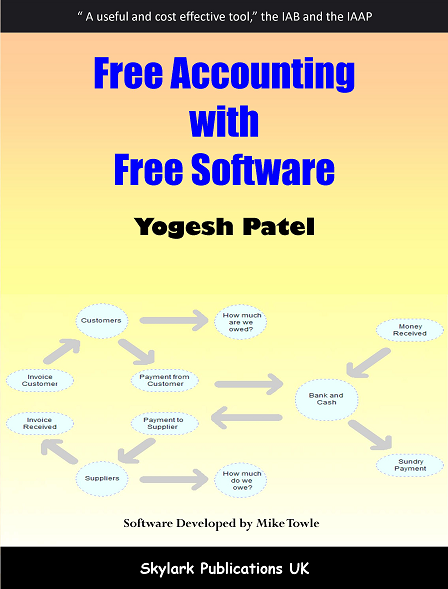 If you are new to bookkeeping, please consider purchasing the book on the left, 'Free Accounting with Free Software'. Click the image for details. Accounting/bookkeeping throughout the English speaking world has two types of terminology. For example, people in the USA and those countries that use their terminology will call the ledger that contains their customers the 'A/c Receivable' ledger. Where as people in the United Kingdom and those countries that use their terminology will call it a 'Sales' ledger. So, if you pay for things by 'Check', please download the USA orientated guides, but if you pay by 'Cheque', please download the UK orientated guides. Downloading and installing or updating the software. The basics of setting up the accounts software. Includes setting up Sales Tax/VAT, entering opening balances, and creating users. Creating customer and supplier accounts, entering invoices and payments. Discounting on Sales Invoices. Creating discount codes, quantity breaks, mark up on cost, etc. Adding stock items to database, opening balances, and controlling stock levels. Purchase Orders and how they integrate with Stock Control and supplier accounts. Setting up Sales Tax and VAT, and understanding how it works in Adminsoft Accounts. For users in the United Kingdom, it also includes details on handling the VAT100 return, MTD VAT returns, EC Sales List and Intrastat. Understanding the AutoManager module in Adminsoft Accounts. This includes the sub-modules PartsCounter and ServiceCounter for handling the retail of parts and servicing of vehicles or equipment. It also discusses setting up cash drawers, receipt printers and bar code readers. Understanding the Shop/cafe Manager module in Adminsoft Accounts. This is for the operation of small cafe/restaurants and shops, and includes table orders, tabs, bills, and handling of vouchers. It also discusses setting up cash drawers, receipt printers and bar code readers. This guide is specific to users in the United Kingdom who need to operate CIS. It shows you how to handle CIS as a sub-contractor, which is quite easy, and as a contractor (which is a little more involved). It includes NI verification and submission of CIS returns directly from Adminsoft Accounts. Understanding how payroll works in Adminsoft Accounts. There are actually two payrolls, one for the United Kingdom and one for other countries. This guide covers them both. Editing and creating print/PDF and HTML document layouts. Handling multi-currency operation. From creating invoices, entering payments, and handling cash/bank accounts. Most sections of the accounting system allow you to add images, from account details, transactions, through to print/PDF and HTML document layouts. This guide explains how handle those images. All above PDF guides © copyright Adminsoft Ltd.